True story…6th grade girl has asked mom for almost 2 years about where babies come from and how it gets in there. Each time she asks, the mom says “not yet.” Mom was too embarrassed to talk about it. The daughter was just about to go ‘underground’ to find out the mystery when she ran into her local superhero…her Children’s Pastor extraordinaire! If you don’t tell her, she’s going to find out from kids at school or search it on the internet. So it’s better coming from you. I have something to help you. 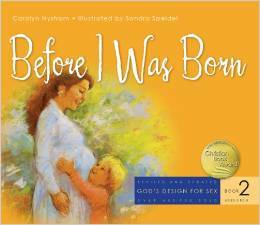 “Before I was born” is a water colors book that walks you through every bit of God’s story in how the miracle takes place. FYI: The age ranges that the book series suggest starts a bit too early for my blood. I jumped straight to book 2 with our 5th grader. The end of the story of the 6th grader’s mom? Well, she went so far as to tell about dad taking out the garbage is his way of buttering mom up. Now, every time the daughter sees dad take out the garbage…she gets a little grossed out. ← Just A Dash of CIT Is Perfect!